Where next for the Doctor and Nardole? ; Rufus Hound tells us why he's proud to be a fan who gets to play a time lord; more. Includes a free poster. Pearl Mackie speaks out; exclusive previews of the new series; more. Classic horror and sf movie posters from the collection of Metallica lead guitarist Kirk Hammett. Interviews with Jane Yolen and John Joseph Adams; forthcoming titles; industry news; reviews; more. Interview with Kinuko Y. Craft; artist spotlights; industry news; reviews; more. Interviews with Ellen Klages and Paul Tremblay; industry news; reviews; more. Ravenor and his retinue are believed dead, and with shadowy forces moving against them, they'd like to keep it that way. They go undercover to investigate a ring smuggling stolen arcane technology. In Brianna's apartment is the last portal between the fae and human worlds. After a magical assault on her home, with the help of her gargoyle Pug, her friend David, and police detective Angelo (who doesn't believe in magic), Brianna recovers what was stolen - and becomes an unwilling heir to her Fae father's throne. 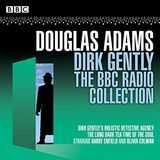 Full-cast dramatizations of Dirk Gently's Holistic Detective Agency and The Long Dark Tea-Time of the Soul, starring Henry Enfield and Olivia Colman. Includes six short novels, two novellas, and four short stories. Nevada's magical ability to tell when people are lying has kept her family's detective agency afloat. But her new case pits her against forces that almost destroyed Houston before, and brings her back into contact with Prime Connor Rogan. As Nevada and Rogan race to discover the whereabouts of an old flame's kidnapped spouse, they are forced to confront Nevada's grandmother, who may or may not have evil motives. In a village at the edge of the wilderness of northern Russia, a young woman's family is threatened by forces both real and fantastical. Hwa is the last person without bio-engineered enhancements on a city-sized oil rig owned by the Lynch family. Her prowess as a fighter gets her a job training the youngest Lynch, but can she provide protection against death threats that seem to come from another timeline? In Kavet, sorcery is outlawed, and anyone who consorts with the Abyssi or the Numini is put to death. When guard captain Hansa Viridian is implicated in a sorcerer's crimes, his only hope of avoiding execution is to turn to the Abyss for help. Offred must lie on her back once a month and pray that the Commander makes her pregnant, because in an age of declining births, Handmaids of the Republic of Gilead are valued only if they are fertile. Offred can remember the days before, when she made love with her husband Luke, played with her daughter, held a job, had money of her own, and was allowed access to knowledge. But all of that is gone now. The Empress searches frantically through the palace for her missing son; the Great Ordeal continues its epic march further north, but the Emperor's decision to let his men consume the flesh of fallen Sranc could have unforeseen circumstances; the wizard Achamian grapples with fear that his journey might be fruitless.